☀ It's the start of the long six week summer break here, and just as I did last year I thought it'd be nice to share some little snippets of life as we pootle gently through our days. I woke up late this morning completely disorientated, not knowing what day of the week it was or what on earth I was supposed to be doing. It was a blissful feeling when my brain finally woke up and I realised I could take my time and nothing much was needed of me for a while. I adore this feeling so much! It's relief mixed with an overwhelming sense of calm. All is well, it's the summer holidays and we will be operating on a completely different schedule for the foreseeable. Yippeeeee!!!!!!!!!!! ☀ Summer holidays for me generally means a lot of juggling. As with most mums of school age children, I'm used to multi-tasking and mixing my parenting with work commitments, and this summer holds a fair amount of both for me. I'm cracking on with lots of Yarndale stuff, working on the content for the printed brochure as well as the big Creative Community project that I organise each year. I designed and made these little "treasure bowls" last week as a project for the Yarndale brochure - they are made from pure wool which means I can put them into the washing machine and felt them.......so much fun! I'll show you more in a separate post as I've got another felting project on the go right now too. ☀ Luckily for us our allotment is only a couple of minutes walk from our back door so we are easily able to nip up most days and check on our small but precious crops. These are my minuscule, super-dwarf beans which I am so in love with - they are ever so cute! Despite their diminutive size they are starting to deliver us some delicious beans and I couldn't be happier. it's like having a row of really well behaved little children all performing over and above what is expected of them. Gold star award for the teensy bean plants, top of the class. ☀ The sweet peas aren't producing a whole lot of flowers to be honest, and look a bit on the spindly side. I have a feeling I forgot to pinch out the growing tips at the seedling stage, so the plants never bushed out like I expected them to. Ah well, I'm happy to be picking small posies each week which are scented to perfection, even if there isn't the abundance I was hoping for. ☀ Our small tenty green house is working out really well and keeping our plants nicely protected from the winds that whip across our sloping hillside plot. We've got cucumbers, tomatoes and chilies growing in here and I love seeing how well they are doing. ☀ This was yesterday's harvest, gathered with a great deal of happy enthusiasm by myself and Little B. We had to carry out a fair bit of adventurous hacking to get to the teensy raspberries through the riot of brambles in the overgrown soft fruit bed. It was rather painful and our haul was a little on the small side, but still, the excitement was unrelentingly high. I let Little B eat the raspberries with some greek yoghurt and honey and he said they were super-yummy. And check out my cucumbers, how good do they look?! So proud of my veggie babies. ☀ I'm working on the printed patterns for my new Summer Ripple blankets this week, which is quite hard going. Taking step-by-step photographs as I create the borders and writing up the patterns isn't nearly as enjoyable as the hooky itself which has been hugely pleasurable. But I'm making good progress and hope that everything will be ready to go by the end of this week. Maybe even Thursday. And in other news, I know I am late to this particular party but I've just discovered frozen smoothie packs at the supermarket. Wow, they are brilliant! They nestle in the freezer between the massive selection of lollies and ice creams and the bags of ice cubes, so you have to kind of know to go and look there for them. There isn't a huge choice in Morrisons, but the above concoction was made from a Red Smoothie pack (strawberries, raspberries, blueberries and mango), blended with a dollop of greek yoghurt and some milk. Yum yum yum, sooooooooo good. The Little People are ecstatic that I'm willingly offering to make these for them without thee need for begging or nagging on their part. We've had this multi purpose blender for almost a year now (it's a NutriPro 1200) and it's fantastic for general blitzing jobs in the kitchen (making breadcrumbs, chopping nuts, blitzing soup, making curry paste, hummus, dips etc) but I've never been bothered to make smoothies with it. However, it really is the bees knees when it comes to blending chunks of frozen stuff, I've been very impressed. .....mmmmmmmmmm. It looks a bit overly health conscious, but actually tastes delicious. Little B couldn't be persuaded though, he took one slurp and said it made his tummy hurt and could he please stick to the pink one. Guess I'll be the one drinking the kale smoothies then. ☀ A photo of our Big Chair, just because I love it so. It's an oversized chair-and-a-half that we inherited from J's parents who were throwing it out and it fits an adult and willing small child quite nicely for film watching and snuggling. I change the blankets over regularly as they get a lot of wear and tear on this chair, and I'm really enjoying the bright pop of colour that the Sunny Granny Stripe is delivering right now. In case you were wondering about the cushion, that's the Water Lily cushion I made last year using Stylecraft Batik yarn (see here for yarn and pattern details). It's grown on me considerably since I first made it, and I do appreciate the more subtle colouring set against the exuberance of all my blankets. ☀ The Big Chair is where I sit when I can't sleep and come downstairs in the very early hours of the morning. I'm generally a good sound sleeper, but due (I suspect) to my hormones, I'm having some very disrupted nights just lately. I wake at 3am feeling as if someone lit a fire under me, and then find it almost impossible to get back to sleep again. I feel anxious and a little panicky, with a racing heartbeat and a mind that refuses to switch down a gear. I've learnt not to struggle with this any more, and instead of tossing and turning I get up quietly, come downstairs, make a cup of tea, sit quietly with the cat and read or crochet a little until the rest of the household wakes up. I was surprised when I got up yesterday morning to see that it was still dark at 4am. So I switched on my my fairy lights and lit some candles, and waited for the sun to wake up. It was so peaceful as I yawned my way through those darkened early hours of the day. ☀ Little B - so very, very happy to be on his summer break home from school. His happiness radiated out of him today as he loafed about listening to music, playing with his lego and watching insane cartoons on Netflix. He played outside too, kicking a ball around with his friends on the street and riding his bike up and down and up and down. The start of the summer holidays always feels so light and joyful, with endless days stretching ahead to be enjoyed and filled with good things. Oh, I'm hopeful for many Good Things. Always hopeful, that's me. We are devouring punnet after punnet of British grown strawberries this summer, I just can't seem to get enough of them. Along with nectarines and cherries, they are a true taste of the summer season for me, and as a summer-loving soul I cannot resist their sweet charms. As a family we eat a lot of fruit every day, and it's my go-to solution during the holidays when the Little People seem to be continuously snacking and grazing. During this past week I've been working on the big Creative Community project for Yarndale*, and have been searching for pretty little crochet things to add some extra decoration to my makes. Flowers are the obvious choice, and I always love creating a bit of floral embellishment, but I was after something a little different. I looked at crochet butterflies (I've already designed bees and ladybirds) but decided that butterflies were something I'd love to explore in more detail at a later date. So I was thinking of various pretty summer things, and suddenly the idea of strawberries popped into my mind. There are already plenty of crochet strawberry patterns out there in the world, but I wanted to have a go at creating my own. I've had a huge amount of fun playing around, and really it would be selfish of me to keep my strawberry-making know-how all to myself don't you think? So I've spent today making, photographing and writing a tutorial, and it is right here all ready and waiting for you in the usual place. .....this is a little taster of the "Creative Hearts" project for Yarndale* 2017 which will launch tomorrow. There will be a full tutorial for making the heart decoration shown here, as well as lots more beautiful hearty inspiration and details of how you can join in with the project. I'm excited to show you what I've been working on! **Yarndale is a creative yarn festival held in North Yorkshire, UK. It is a for-profit organisation, and I am one of the five organisers. 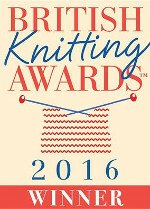 You can find more details on the Yarndale website. Since moving from the outskirts of a city to a rural market town seven years ago, one of the many things I really appreciate is how I feel so much more aware of the seasons. I think there are several reasons for this, the first one being the beautiful view from my Attic window. Every single day I look out across the rooftops to the fields and hills beyond and observe the ever changing colours as the weather and seasons do their thing. Where I used to live there were no hills. None-what-so-ever. The landscape was as flat as a pancake and as such it was hard impossible to really get a feel for what was going on around you. The compensation for this was Big Skies, but oh I do really love to be surrounded by hills and I don't miss that flattened out landscape one little bit. I also used to go almost everywhere by car when I lived on the outskirts of the city, as everything I needed to get to on a daily basis was so much further away. Living here I walk absolutely everywhere, which means I am very much more aware of the weather conditions/seasons as I am not riding around in a metal box. Blogging my daily life is also a terrific help in reminding me of my connection to the land and the seasons. My blog gives me a precious little window to gaze through and gain access to my faded memory banks, and I am often surprised and delighted by the rhythmic and repetitive nature of my lifestyle. It tickles me that year after year we do the exact same things on more or less the exact days of each month! For the past three years, June has been the month of the Elderflowers. There are a lot of trees in my neighbourhood, they sprout like giant overgrown weeds in the most unlikely of places - along roadsides and verges, in hedgerows, along paths and even out of walls. In early June as I go about my business to and fro, I keep an eye on the flowers, waiting patiently for the tight little green bobbles to open up and produce a froth of creamy white, teeny tiny flowers. Last year we made our first pickings right in the middle of the month, with a second batch a week later. This year, the flowers have been late as we had a very long, cold Spring and Summer has been slow to get going. But during the last week in June I suddenly noticed creamy white flowers everywhere and knew it was finally cordial making time. I went with the Little People on Monday evening after dinner to gather in the floral booty. It had been a very hot sunny day and the evening remained balmy and completely summery, it was a gorgeous time to be out and about. This year I found a new place to go not far from home where there was an abundance of trees laden with flowers. So I was able to snip the stems freely, taking only a handful from each place as we strolled along. There was also the bonus of finding a great swathe of ox eye daisies growing wild along the road side, so I thought it would be ok to gather a few. We were walking along a quiet access road along the back of the railway track, not very picturesque but the flower bounty more than made up for the rather industrial feel of the location. I filled my bag with flower heads, emptying them out onto the back yard table once I was home. I spent a little bit of time freeing up the critters and snipping off as much of the green stems as I could manage, counting the flower heads as I went. This year we had gathered 63 so enough for 2.5 batches of cordial - result! Put 1.5L boiling water into a large pan on the hob with 1kg of white sugar. Bring to the boil, stirring as the sugar melts. Add in 25 polleny elderflower heads (stalks removed), stir well and bring back to the boil. Take the pan off the heat. Add in 30g citric acid (I buy from the local health food shop, but you can find it on Amazon ), plus 2 sliced oranges and 2 sliced lemons. ....ahhhhhhhhhhhhh, the very taste of Summer in a glass! ps elderflower cordial also freezes well, I save up small 250ml water bottles to use for this purpose. #1 :: I've loved looking upwards as I've walked around and about the place. It's made me so happy to see the most beautiful blues skies and feel the gentle warmth from the bright winter sunshine. #2 :: I've loved pottering around my town, visiting friends, the market, the park and local shops. #3 :: I've loved seeing my two boys slowly recover their energies and appetites, kicking those germs into touch. We've eaten lots of fresh fruit, salad and veggies this week. #4 :: I've loved watching my Little People at play, both individually and with each other. Some very sweet role-play games have been taking place (we are at home for half term this week), and the pop up tent has been in almost constant use. #5 :: I've loved seeing my little clump of snowdrops get ready to open their petals as the sun shines down on them. #6 :: I've loved making (and eating) an incredible new snack/addiction which is thankfully a little healthier than tiffin. These are curly kale crisps which I learnt about on Hannah's lovely blog Homebaked. Half a bag of sliced curly kale with a drizzle of olive oil massaged in and a sprinkling of sea salt. Spread on a baking tray, bake in oven at low temp (150C) for about 25mins until kale is crisp. Utterly delicious. #7 :: I've loved putting a few stems of baby narcissus into the old glass bottles on my bathroom windowsill. They completely light up the room and make me smile every time I walk in. #8 :: I've loved using this bar of handmade soap bought from a local shop. My last soap (wild rose) from the same shop ran out a few weeks ago and so I treated myself to a new one...it smells lush. #9 :: I've loved browsing through this beautiful book-zine at bedtime. The pages are filled with colour and inspiration, it's quite wonderful. More info here. #10 :: I've loved getting this book in the post today, I ordered it from Amazon after reading about it in the above mentioned Mollie Makes Home. I think the author (the founder of my fave company Rice DK ) somehow sneaked a peek inside my Creative Mind and made this book especially for me. I'll write more about it soon when I've had chance to read it properly instead of just dribbling all over it. #11 :: I've loved taking a train journey through the cold, frosty landscape with Little Lady today. We went to The City to shop for clothes (her) and pretty things (me), and had a lovely time out together. She is the sweetest companion, I found I laughed a lot in her company. #12 :: I've loved bringing these sweet new tins home to the attic, they are of course from Cath Kidston. Destined to go and live very soon in my new work studio. Shall I say that again? Uh-huh...that's right...s-t-u-d-i-o. The most exciting, wondrous developments happening here behind the scenes. Squuuueeeeeeeeeeeeeal! More of that very soon. #13 :: I've loved coming home from The City with exhausted achy feet and flopping down on the sofa to drink tea from my new mug. Cath Kidston again, I LOVE this new design called Daisy Rose Check. #16 :: I've loved looking forward to going to the coast, yaaayyy! This gorgeous looking building is the youth hostel at Whitby, and we've booked a family room to stay here tomorrow night...it's right up on the top of the cliff next to Whitby Abbey. I am really, really looking forward to it, we leave tomorrow morning for two days of seaside pootling. Fingers crossed for good weather, well dry weather (without snow, hail or rain) will do nicely. See you when I get back from beside the North Sea!